Serbia is a European country located in the Balkans. It is a part of the former Yugoslavia, and it is a beautiful country that gains more and more popularity as time goes by. What Serbians take most pride in is their ski resorts. There is one in particular called Kopaonik. BBC declared it one of the best ski resorts in all of Europe. But that is for you to enjoy during the winter. In the summer, you can explore many national parks that wait with stunning views and picturesque landscapes. The Tara National Park is something that you must see. The Drina River makes its way between the mountains. It is a beautiful treasure hidden in the tens of thousands of acres. But before you travel to Serbia, you need to check whether or not you are required to obtain a visa before departure. While Serbia is a European country, it is neither in the European Union nor the Schengen Area. However, its visa policy is quite similar to the one of the Schengen area. As a result, 93 nationalities can enter Serbia and spend up to 90 days within the country. The duration of the stay differs depending on the nationality, but it varies from 14 to 90 days. All the other nationalities must visit the nearest embassy and apply for a consular visa. If you want to know which category you are in, you can take a look over Serbia’s visa policy yourself. However, we think that iVisa’s Visa Checker is far more convenient to use. Click on the Visa Checker button located in the top-right corner, select your country of origin in the menu on the left, and choose Serbia in the menu on the right. The result will display whether or not you need a visa, and if you do, you will get a list of the nearest embassies where you can apply. 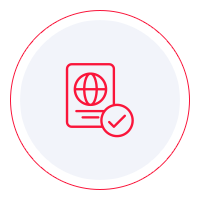 Since electronic visas are not available, iVisa cannot process visa applications at the moment. Should that change in the future, we will be able to be of more assistance. Meanwhile, if you need information, you can contact our support service. It is available 24/7, and you will not be charged for using it. If the Visa Checker lets you know that you do need a Serbia visa, you must inquire about the requirements. The internet is full of such information, but we recommend that you take it with skepticism in mind and use it as a reference only. The information you find online is not always the most reliable. That is why our suggestion is to call the embassy or the diplomatic mission and ask them about the requirements. That way, you get the info you need from a reliable source. In the meantime, what we can tell you is that all travelers who plan a trip to Serbia need a valid passport that remains as such for at least another 3 months from the date when the visa is issued. We regret that we cannot be of more help in getting your Serbia visa, and we hope that the information above is of some assistance.